Alvin Wilson, Lieutenant with the Burton Fire District, needs a new liver and the help of his family, friends and community to make it happen. Transplants are lifesaving but very expensive. Over the past two years this disease has taken a toll on Al’s overall health. 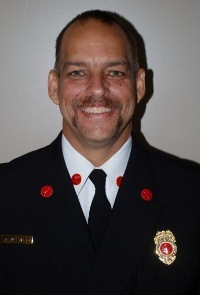 He has had to move to a light duty position at the fire department because he has lost a significant amount of the strength and endurance he needs to fight fires. You may know Al through the fire department or through their church community at Community Bible in Beaufort. He is 49 years old and was born and raised in Beaufort. Al served in the United States Air Force for 5.5 years, where he met the love of his life, Patty, while they were both stationed in Spain. They have been married for 28 years. Patty is a substitute teacher and they have 3 children together. Al also owns a lawn care business which has been affected by his health as well. Alvin is in the process of working with doctors at the Medical University of South Carolina to be put on the transplant list for a new liver. While insurance will cover most of the transplant surgery, the estimated out-of-pocket expenses that Al and his family expect to pay is a minimum of $10,000. The out-of-pocket expenses will include pre-transplant medical services, post-transplant medications (a lifelong expense), travel, food, co-pays, deductibles, and hotel expenses for post-transplant. To help with the financial burden of Alvin Wilson’s uninsured expenses, a fundraising campaign in his honor has been established with HelpHOPELive, a trusted nonprofit organization that has been providing community-based fundraising guidance to patients and their families for more than 30 years. All donations are tax-deductible, and are held by HelpHOPELive in the South-Atlantic Liver Transplant Fund and are administered by HelpHOPELive for transplant-related expenses only. Please consider a contribution. Your support is critical to the overall success of Al’s struggle. Please know that your contribution counts. On behalf of Al and his family, we thank you for your kind consideration. Here is a long overdue update on Alvin Wilson. Basically, he is rapidly healing without any complications. He had a stint removed that was placed during his liver transplant. The doctors have said he can start lifting items, but nothing too heavy (NO ENGINES). He will probably be cleared to go to church and other public places at his next doctor’s appointment on June 9th. We are thankful for all the prayers and generous support. We continue to be in awe at his successful recovery! Doctors are adjusting his medication on a weekly basis based on his lab results. We have had a little caretaker reversal the last couple of months. I have had some medical issues and I had a minor surgery four weeks ago which was unsuccessful. On Tuesday, May 17th, I had a hysterectomy and Al has been my caretaker. He has been at my side for all my surgical procedures. I’m pretty sure that he still owes me bedside time. He has been a great help and I am thankful he has been able to help me! I’m thankful that I was well enough to return to work within a week of my surgery. Alvin Wilson had a great check up from his transplant clinic appointment. The doctor reduced the amount of prednisone he needs to take and he no longer needs to be on a high protein diet. Al is very happy that the doctor decided to let him drive, which is two weeks earlier than most liver transplant patients. He still has to take an easy and cannot lift anything heavier than a phonebook, and he has to stay away from crowds. He has been blessed not to have any infections during this weakened state of his immune system. Al is very thankful for all the support he has received from friends and loved ones. Al had a great clinic appointment on Monday. The numbness he is experiencing is probably where a nerve was stitched. This is a minor problem compared to the magnitude of the procedure. Physically, he is doing well and he does not have to return to clinic for 2 weeks. He is still getting lab work done twice a week. He will have to stay away from crowds for a couple of months while his immune system is being adjusted to accept the new liver. We had a great Easter with family and friends this past Sunday. We are continually blessed by the generosity of others. Alvin Wilson is doing really well. Al would like to thank all for the encouraging get well cards, generous gifts, prayer support and delicious food that have been provided. He is not allowed to be around large crowds due to his weakened immune system. Many people have visited him and he appreciates the distraction. We are very careful to wash our hands frequently and keep him away from anyone with a hint of sickness. He will return to the Liver Transplant Clinic on Monday, March 28th. He has been going to the local lab for his blood tests. We were prepared for a longer recovery period; thank God his recovery has been going very smoothly. He is experiencing a couple areas of numbness which he will ask the doctor about on Monday. Please pray that this slight inconvenience is nothing serious. We are so excited that Alvin Wilson was able to come home today! His Albumin score was not quite 3.0, but the doctor removed the feeding tube and said he could return home with many limitations. He won’t be able to drive for 2 to 4 weeks. I’m sure he will enjoy being chauffeured. He can’t be around crowds or anyone who might be sick. His immune system is greatly reduced because of the anti-rejection medication he is taking. We continue to be blessed by many people in many ways and we are grateful. It is refreshing to see Al back in his recliner starting to look like his old self. We are grateful for all who helped make this moment possible! We were able to view Al’s Albumin score for last Friday and it was 2.6. We are pretty sure that his level will be at least 3.0 for his Monday Clinic appointment with the surgeon. We are praying his feeding tube can be removed and he will be able to recover at home. We are thankful for the prayers and continued support. Alvin Wilson’s Albumin level went from 1.8 on Monday to 2.3 on Wednesday. We haven’t been able to view his Friday’s lab results yet, but if his score reaches 3.0 by Monday, he will probably get the feeding tube removed. Once the feeding tube is removed, he will probably get to go home!!! He will still have to come back to MUSC for clinic once or twice a week, but he will enjoy being home. We continue to pray his Albumin level will reach the desired level and that he will no longer need to take insulin. We have been told that once he is off the feeding tube, that he won’t need insulin. We are so thankful for all the prayers, support, and visitors. I was reminded of God’s grace on Al this week when a coworker told me that her friend passed away this week waiting for a liver transplant. This has been a humbling experience for our family and we are grateful!!!!! We give God the glory for the speed of Al’s recovery. Alvin Wilson is supplementing the Prostate with another high protein-low calorie drink. The supplies I ordered should be here tomorrow. I am hoping they arrive early tomorrow so that he can get the supplements as soon as possible. We were very humbled today to receive a card sending sunshine our way from Mac and Stephanie Fowler. The love of Christ radiates from this loving couple who have experienced so many trials of their own. Please pray for Mac’s healing of two broken legs and that Stephanie continues to seek God for her strength. This couple has been a blessing to our family and to many other families. I pray that God will meet all of their needs as He continues to meet our needs. Al continues to do well. We have administered too much ProStat which is a protein suppliment. I was reading the bolus directions for the rinse and applied it to the ProStat instructions. I don’t think too much protein will negatively affect him. Now he needs more ProStat. Please pray that the supplies I have ordered will arrive soon. Alvin Wilson had a good report at the post liver transplant clinic. He is doing so well that he doesn’t have to return until next Monday morning. He will go to a Lab near the hotel on Mondays, Wednesdays, and Fridays to keep track of his liver function. If his medicine dosages need to be changed, doctors will let him know. He continues to tube feed at night and take protein supplements 5 times a day. He is still on insulin, but we are praying that this is temporary. Al needs his albumin level to rise above 3.0 to get off the feeding tube. Please pray this score will reach the desired level. We continue to be grateful for all the support we have received. Alvin Wilson survived his first day out of the hospital. The home health nurse arrived a little early according to our watches. Then she politely informed us that the time changed last night. I usually change all my clocks in the house to prepare for church, but today I watched the church service on the live web feed. I was praying for Pastor Larry as he preached because I could see his discomfort. We are blessed by modern technology to keep us united with our church family. We had many family and friends visit today and we really appreciate all the help others have offered. I often quote Philippians 4:19 “My God will supply all your needs according to his glorious riches in Christ Jesus,” now I am living that verse. Tomorrow, Al’s mom (Regina) and I will accompany Al on his first post-transplant clinic. We both are being trained on being Al’s caregiver so we can swap off. Al and I are fortunate for her unselfish help. Al continues to do well physically and we pray this pattern will continue without setbacks. Alvin Wilson is doing really well. It was a very long day, but I’m happy to say that we have made it to a hotel in Charleston. We had a really nice home health care nurse help us get settled into our new medical routine. Monday Al will start his daily post liver transplant clinic visits. We had to order a month’s supply of tube feeding nutrients to make sure his calorie and protein levels stay sufficient for recovery. We are very thankful for those who have supported Al financially because our insurance company does not cover any of the tube feeding supplies. He is currently having to take insulin injections and our insurance does not cover some of the diabetic supplies either. Please pray that when Al reapplies for VA benefits, that he may get enough to cover his pharmacy expenses. We have been blessed with his recovery process to far and we are thankful all who have helped make this possible. Alvin Wilson was moved to a normal hospital room last night around 11:00 PM. Most of his IV lines were removed along with the catheter. So far today, we have been educated on his transplant medication, his medicine induced diabetes, his diet and nutrition, and other follow up procedures. At the moment, it looks as though we will be moving into a hotel in Charleston on Sunday and will stay about a month depending on Al’s progress. He has been standing, sitting and walking. With increased activity he has experienced more discomfort. We have to view videos and complete a written test before Al is allowed to be discharged. They want to make sure that we have all the procedures down pat before discharging him. Once he is discharged, he will still be evaluated on a daily basis to make sure the liver continues to function. Please pray that this process will go smoothly and that Alvin will be back to his normal self soon. Doctors have decided since Al’s lab results are trending upward and he is able to walk that he is being transferred to a normal room on 6 East. They are not waiting on the biopsy results. A doctor this morning called Al a conundrum. He may be discharged as early as this weekend. We continue to see God’s healing hands on Al’s body! Thanks to all for continued prayers and support!! Al had a long day filled with lots of lab work, insulin treatments, supplemental oxygen, x-rays, sonograms, EKG’s and a liver biopsy. He is keeping a positive attitude and continues to do well physically. We won’t know the results of his liver biopsy until tomorrow. We are hoping to hear that his liver function is trending in the right direction with no other setbacks. We are thankful for the prayers and support by our friends and family. Alvin Wilson’s liver functions are not what doctors were hoping for. The Chief Transplant Surgeon is “relatively anxious” so he is recommending a liver biopsy. Physically he is doing well. Please pray that the liver is functioning and not dead. Hopefully, this is just a glitch. We continue to appreciate all your prayers. Al was not transferred into a normal room today. He has an elevated INR which means he clots slowly. He had issues with his INR prior to the transplant and doctors are conferring with his hematologist. Please pray that this issue can be resolved and that he can get back on track. He had 2 sonograms which did not indicate and problems. Physically he is doing well, but his lab scores do not reflect his physical condition. Thanks for your continued prayers and support. Happy to report Al is able to sit, stand and eat clear liquids within a day after surgery! Al spent the night in The Surgical Trauma ICU. Although he is very sore and requesting pain medication, doctors are amazed at how well he is doing. He is currently having a sonogram and we will know the results shortly. If doctors are pleased with everything, he will get transferred to a normal room. Words cannot express my gratitude for the family who made this possible. Their loss has brought hope for my husband and I am grateful. As a mother, I can feel what the donor’s mother must be going through and I grieve for her loss. I pray that her family will receive a blessing knowing that they were instrumental in the wellbeing of Al. Al’s surgery was a great success. Doctors are pleased and he may be released to a normal room today! Thanks again for all the support and prayers! Al is in pre-op waiting for his transplant surgery. We appreciate all who have helped make this possible, especially the family of his donor. Please pray for comfort for them and a smooth surgery and recovery for Al. Al is being prepped for a liver transplant tonight, 6 March 2016. We are still waiting to hear that the liver is viable. Surgery could be as early as 8:00 PM tonight to tomorrow morning. The procedure could take from 3 to 6 hours. We are praying everything goes smoothly. Thank you for your continued prayers! Al and I are so thankful to report that he has finally been approved for the liver transplant list. We have been told it can take a week to 3 months for this to take place. We would like to thank our church family and friends for their prayers and support. Many have helped me by comforting my mom as she is in Bay View Nursing Home. Many have helped financially and some anonymously through the helpHELPLive foundation in Al’s honor. We thank Nichole Bright and Burton Fire Department for setting up the support page. Al and I are fortunate to have the support of our bosses and co-workers and we appreciate their support and understanding as we travel through this medical journey. I thank my family for helping me to make difficult employment decisions and my mother-in-law for the many sacrifices she makes, especially her willingness to accompany Al on his appointments. We continue to be comforted by Philippians 4:6-7, “Do not be anxious about anything, but in everything, by prayer and petition, with thanksgiving present your requests to God. And the peace of God, which transcends all understanding, will guard your hearts and your minds in Christ Jesus. Your news updates are more encouraging everyday! God's "fingerprints" are all over this! Sending our love and continued prayers! Alvin, I am so glad that you are doing well. Will keep the prayers coming! I pray for courage and strength for your whole family. Love to you! Al. Patty and family. I have tried to keep all updated as you and your family are loved by so many. I pray that your body will heal without complications and that the Lord wil put a shield of protection around you all. God bless you as you go through this. Remember your Church family is here for you. And Ron and I are here for you. Wonderful to hear surgery went well...what a great relief and answer to much prayer. Y'all are such "troopers" and in this long process of praying and waiting, have been an encouragement to all of us. Now, you get some much needed sleep, sweet Patty! Al, you're such a dear brother in Christ. My thoughts and prayers are with you - and Patty too, of course! I love you both very much!!! Alvin, I've known you & your family for at least 40+ years. It's to the point that you all seem like family to me..I'm so sorry you're being confronted with this ordeal in your life & I'm here to help if I can..I will be submitting a donation to your kidney fund and I pray that God will enable you to find a compatible one for you..My thoughts & prayers will be with you until this ordeal becomes a victory for you..I love you Al like one of my own. We love you Alvin! Sending prayers and sharing your message to help any way we can. You and Patty are strong testimonies of courage and faith in our Lord in the face of the "seemingly overwhelming health issues" but you are resting in and relying on Him and HE is faithful! Our love and prayers go with you. Alvin, I am so sorry you are dealing with this, but I am confident that God has better days planned ahead for you and your family. May you find confront knowing you have many many caring, supportive, and loving friends believing in this process and in knowing that we are all here for you. You're in our daily thoughts and prayers. You are in our thoughts and prayers Alvin! You are in our thoughts and prayers. God bless you and your family. Love. STAY STRONG WE ARE ALL PRAYING FOR YOU!! Sending healing thoughts and prayers your way. I hope our BHS alumni stand together and help during your time of need. So sorry you have to go though this. Although there are miles apart we are never far away. You got this! Prayers to you and your family!! Alvin praying for you, and your family as you all go through this together. I am only a phone call away if you need anything. So sorry to hear you are going through this! I will be keeping you and your family in my thoughts and prayers. I love you and Patty so much! I'll never forget the years you two supported Randy & I on the mission field, and the way you've shown true friendship to Labi & I in the past year. You're in my prayers always. God is faithful and I'm so blessed to have a chance to participate in meeting your needs. Thank you for being such a great example of grace and mercy. Sorry to hear of your battle, and will be keeping you and your family in my prayers. Don't know if you knew John Abercrombie, he was a few years older than us. Anyway, he just went through this last year. He and his wife Tracey (Williams) may be a good sounding board and wealth of information for you and your wife. He has recovered beautifully after his transplant. God can handle this...don't ever doubt it. Hello Alvin!! Hoping for the best. I'm here if you need anything. Praying for you, Alvin! If I can help with anything... Just call.